the meatloaf looks yummy. i'm not a big meat eater, but once in a while i'll get a craving and made meat loaf about 3 weeks ago. i like it with green peppers, onions, garlic. do you use ground beef, turkey, pork, veal or a combination? What a lovely plate of food (though I've never been a huge meatloaf, or even a lentil loaf fan -- it still looks great). Blackberry pie would be scrumptious, too. It sounds like you had a pleasant Easter! We had shrimp and polenta here, with a fennel and parmesan salad. It would have been shrimp and grits, but I'm not sure how easy grits are to get in Northern California. And there was plenty of chocolate for dessert. I love that movie and your dinner is making me drool;) For Easter, I made a ham (actually I heated it up in the oven), made whipped potatoes mixed with Parmesan cheese, and whipped-up a nice gravy for my wife and kids to enjoy. I didn't prepare anything yesterday coz we decided to just go to a neighbor's place...lol..
"Brit Boy" What a nickname!! Does he get an avatar? Back in the 80's I spent a lot of time (years) in Germany & I'd take off to Italy every now and then, basically to experience somewhere warm. One Sunday I found myself in St. Peter's Square, listening to Pope John-Paul II give a Sunday message. I'm not Catholic either, but I wouldn't have missed it for the world. I love my mommy's meatloaf and my dad loves the Christmas Story. Your meatloaf looks amazing. I would love your blackberry pie recipe. I enjoy baking pies and will only eat homemade since I am a pie snob. Glad to hear you had a nice Easter! I haven't had meatloaf in ages! My Mom used to make a pretty good one! I love that movie too and started laughing out loud when you talked about that part!I remember it well and glad you all had a great EAster! Hi Dor, that looks like a hearty meal. I thought you would share the recipe. Dori I am so glad you had a wonderful Easter, myself and my family did too. It was a blessed day for us. You and I are so alike on this. I'm not a big meat eater either, but the craving hits every once in a while :-) I usually make it with green peppers like you, but this time I tried red peppers and it turned out great. I used some lean ground beef to make it. Isn't A Christmas Story great? :) I loved it a few years back when they played it continuously for 24 hours from Christmas Eve to Christmas Day on TNT. LOL. I was saying the dialogue all day long. Yet again, we have something in common. You have a great week too! Glad you like the movie too. And I love to talk food with you ;-) I love adding flavors to potatoes...I'm sure your dinner was great. I tell you, I just love that so many of you all love that movie too. LOL. Kindred spirits we are Heidi ;-) Just ask Brit Boy, I say that line from the movie sometimes when we're cooking something totally different than meatloaf, I just love saying it. LOL. Hope you had a great Easter too! Which recipe would you like...the meatloaf or the pie? I'm going to post the pie recipe soon when I get it worked out fully :-) I loved visiting your blog and thanks for visiting me. Coming over for the first time today from Operation You. Love your blog and the awareness you raise here. Will certainly be back soon. After reading this at 11 30 at night, I am hungry. The photo's did not help the matter either lol. Glad you had a good Easter. Yes, I really enjoyed Easter..that meatloaf was a big hit :-) Love Operation You and I'll be stopping by more definitely. And yeah, I was born and raised in Georgia...so Georgia Peach over here :-) Thanks for visiting me. Hmmm meatloaf. 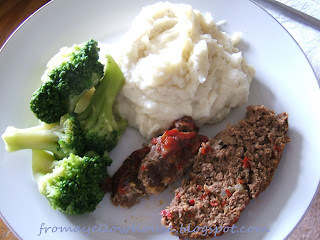 I make a veggie meatloaf out of pecan meal and oatmeal and cottage cheese. It's really good. I've never thought or even heard of the Pope's Easter message, learned something new.